A leisurely place to visit where anything is possible! Greetings everyone! It’s almost Christmas, and I’d like to share a wonderful article from Kenneth Copeland’s site about St. Nicolas, a.k.a.Santa Claus. I hope it inspires you for this most wonderful time of the year. Each December, images of Santa Claus are everywhere. We see visions of a large man in a red suit with a long white beard and rosy cheeks. But the real Santa Claus, or St. Nicholas as he is known, was not some marketing invention. He was a godly man whose giving spirit became an example of Christ’s love. From what is known about St. Nicholas, he lived during the third century in Turkey. He was from a loving Christian family who taught him the importance of loving God and honoring the Lord with his giving spirit. At 19, he joined the priesthood. His uncle, a bishop, prophesied that Nicholas would lead and encourage people. He also prophesied that Nicholas would become a bishop and lead a spiritually fulfilling and devout life. In fact, Nicholas did help the poor, became a bishop and lived with a desire to honor God in everything he did. He was known to spend entire nights tirelessly studying God’s Word just so he could bring fresh insight and revelation to the people in his congregation. He was known for reaching out to those in need, praying, fasting and relying on God’s Word completely. The true story of St. Nicholas is a beautiful picture of the giving that Christmas is all about. The greatest gift that anyone can ever receive is the gift of Jesus Christ. He was given 2,000 years ago to all mankind by our Heavenly Father so that we could have a relationship with God. Jesus is our hope, redemption and victory. He’s the reason we can experience the Blessing in our lives. He is our advocate with the Father, our blood-covenant friend who will never leave us nor forsake us and continually works to bring to pass the New Covenant. In Him we have the joy of living a heavenly life on earth. 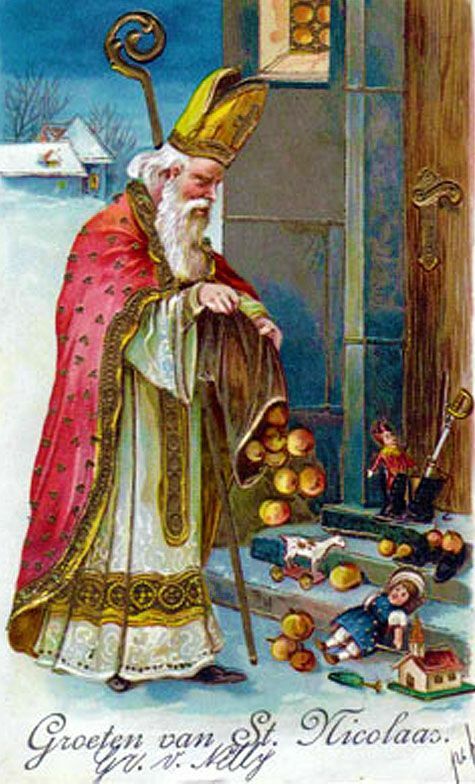 St. Nicholas, the real Santa Claus, exemplified the real meaning of Christmas. Christ mass means “anointing celebration.” It’s the celebration of “How God anointed Jesus of Nazareth with the Holy Ghost and with power.” It’s the celebration of how the anointed Jesus “went about doing good, and healing all that were oppressed of the devil” (Acts 10:38). It’s the story of our triumphant Savior, Jesus the Christ, the Lord of lords and King of kings! Merry Christmas! Until next time, may happy days abound! Artist Catherine Donahue acquires a commission to paint the cover of an author's new historical romance novel, drawing her deeper into the nostalgic emotions she's been recently experiencing toward a past love. Will this new adventure keep her stuck in the past, or will it be a second chance at love? Lijuan loves to dance. But when a curse befalls her, will she conquer or be under its spell forever. A short story of raw passion, courage, and love. See how Divine Will handles a woman's insidious habit. You won't want to miss this. MORE than a STORY…A LIFE! All text, stories, poems, and art on this blog are copyrighted by Marianne Coyne unless otherwise noted. If you wish to use any of the contents, please leave a request with your intent. Thank you. "Softly Spring" decorated gift box.